The Emotional Quotient Inventory 2.0 (EQ-i 2.0) measures an individual’s emotional intelligence. Science and professional feedback from the EQ-i® strengthened the direction of this second generation assessment. Now, it’s a complete experience with a new and intuitive model, customizable reports, and an online platform for easy administration. 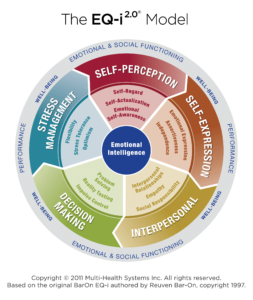 Mayer-Salovey-Caruso Emotional Intelligence (MSCEIT) is developed by academics at Yale and the University of New Hampshire in cooperation with MHS, the Mayer-Salovey-Caruso Emotional Intelligence Test (MSCEIT™) evaluates Emotional Intelligence through a series of objective and impersonal questions. It tests the respondent's ability to perceive, use, understand, and regulate emotions.